Working long hours on a computer can have dire effects on your health if you do not take a break from time to time. There are many syndromes and disorders which result from over-using a computer. Preventing them only requires looking away from the screen for a few seconds, but it is not something you can easily incorporate into your daily routine. 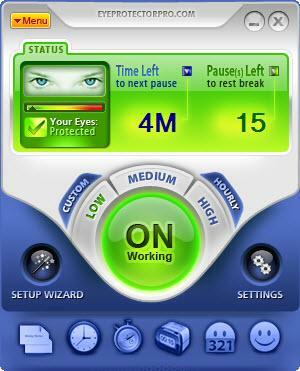 EyeProtectorPro will remind you to rest your eyes according to a fixed or custom countdown. You can also use it to remember other important tasks due to its additional timers and reminders. The operating systems which support this application range from Win 98 to Win 7. It is not too demanding when it comes to system requirements and you can run it after a speedy installation process. A wizard will help you make the initial settings when running the application for the first time. During its stages, you may specify different time intervals for working time, break duration and others. The main timer can be started by clicking a large, colored button on the center of the interface. Pre set time intervals, from two minutes to one hour, can be selected by clicking one of the buttons placed around the on/off one. It is also possible to select your custom time interval by clicking the Custom button in the same area. During the last 20 seconds of the countdown, a small window will appear on the screen, reminding you to look away from the screen. After the last 20 seconds, a dark screen will be enabled and it will last 15 seconds. A Skip button is available if you do not want to wait. A different duration for the black screen can be set during one of the setup wizard's steps and you can also disable the Skip button. If the computer is idle for 10 seconds, the application will detect this and it will add the idle time to the countdown. The functions from the main settings panel are organized under different navigation tabs. Here you can enable breaks, which last longer, the number of pauses between the breaks and others. Timers, countdowns and reminders can be set up from here as well. Once activated, they will be displayed in small windows on the screen. Before activating them, you can type a message which will be displayed when a timer reaches zero. Due to its flexible options, the application will not hinder your work. You can set up your own timetable or enable a skip button if you are in a hurry to finish a project. There are many other features which will help you organize your work and breaks. The application's trial period lasts for only 7 days. A few seconds is all you need to have healthy eyes. EyeProtectorPro will remind you of this with its efficient and flexible timing features. You can download EyeProtectorPro free here.